A must have product to have with you on your caravanning adventures. All Kampa awnings come ready-fitted with attachments to accept this storm tie-down kit. Simply clip one end into the buckle on the awning and peg the other end with the peg supplied. If you are expecting particularly windy weather, these strong tie-downs assist the guy lines of the awning and importantly, pull on the frame, not the canvas. 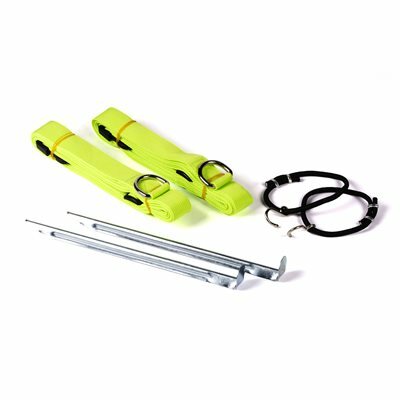 The Storm Tie Down Kit is suitable for most current Kampa awnings including all of the following, Rally, Fiesta, Ace, Frontier, Grande and Club. Also fits Tents: Kampa Bamburgh 6, Croyde 4, Croyde 6, Croyde 8 and Broadhaven Tents. I received this product from over seas to the US. Package came in about 12 days with standard shipping. The storm ties it's self are of excellent materials and seem to be very sturdy. I feel for the price the pegs could be of better quality. With that in mind a good product to add extra storm protection to your Kampa tent. However, since the awning has demonstrated an alarming tendency to collapse inwards at the corners in the event of high-ish winds or heavy rain, I'd suggest they need to be standard equipment rather than optional extras. Got the Kampa porch awning. Needed this to tie it down. Would really help if Kampa included it with the awning. that said the price is good. Camping world is a great place to buy from. Ordered this item monday evening;received the item thursday morning. Perfect. And this rating goes for all other items, I have bought from Camping World. Absolutely fantastic, very easy site to use, quick with delivery but most of all the item is perfect. 5* service.